Frankfurter (Emulsion-type sausages) may be spoiled by many vegetative cells and contaminated after heat processing and during other processes such as slicing, packaging, peeling. Food-borne pathogens such as Listeria monocytogenes, Staphylococcus aureus, Clostridium perfringens, and Salmonella spp. may present these products. 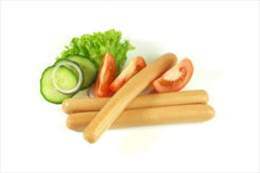 Oxidative rancidity will decrease overall quality of frankfurter.